This year, late in the summer, University of Oxford computer scientist Alex Rogers got an alert on his phone. It was an email from an automated system telling him that a recording of a New Forest cicada's song might have been detected. 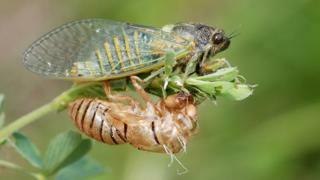 The species, Cicadetta montana, hadn't had a confirmed sighting in Britain for 15 years. It's a fascinating creature - the only cicada native to Britain and one which is considered endangered across much of Europe. When Dr Rogers looked at the sonogram he realised this could indeed be the insect he, his colleagues, and thousands of citizen scientist volunteers had spent the last two years searching for. He grabbed some professional recording equipment and jumped in his car. In a few hours he was on site at the GPS location attached to the original recording. In no time at all he picked up the singing of an insect - but it wasn't the fabled cicada. "It turned out to be a Roesel's bush-cricket," he remembers, a little forlornly. "And I think I found the cricket that had triggered the original observation." Since the spring of 2013, over 3,000 members of the public have downloaded the Hunt for the New Forest Cicada app for their smartphones. Because the cicada sings relatively quietly at 14 kHz, just above the range of hearing for many adults, it is generally difficult for people to hear outdoors. Surveying with some technological assistance is required. When a user of the app reaches a place in the forest where they would like to carry out a survey, they point their phone in the direction of some cicada-friendly foliage, press a button on the screen and wait for 30 seconds. An on-board algorithm then instantly analyses the recording to see if something like a cicada's call has been found. If it has, the app transmits a report directly to Dr Rogers and his Oxford colleague Davide Zilli, both of whom originally started the project at the University of Southampton. A total of 10,000 surveys have been carried out, mostly within the New Forest, but also in countries like Slovenia where the same species of cicada is more prevalent. Positive identifications of the insect there by app users have provided a useful control for the experiment, suggesting that if the cicada does remain in the New Forest, the app would have a chance of finding it. But the challenge of detecting one in Britain is significant, according to Paul Brock, an entomologist and scientific associate at the Natural History Museum in London. "They're pretty elusive creatures to find," he says. "It's a major challenge, basically." Brock adds though that he is personally convinced the cicada is still hiding somewhere in the New Forest. "I think the species is still hanging on somewhere. It's probably in a remote location, as it has been before," he comments. "The habitat is still there, you've got to question why would they vanish?" There have been some changes in how land is used in the New Forest in recent years - a reduction in grazing in some areas for example - and there have also been some alterations in Britain's climate. But Brock, who has witnessed the rediscovery of more than one rare British insect years after it was thought long gone, still holds a vigil for the cicada. After all, it may simply have moved to new locations in the forest rather than disappeared completely. The fact that the insect is likely located in remote parts of the New Forest rarely visited by people - if it is there at all - does throw a spanner in the works of the citizen science project, however. The surveys might have mostly been carried out in the wrong places. But Dr Rogers and Dr Zilli have a plan. Next May, they will deploy 100 unmanned, stationary computer chips throughout the forest. These include a microphone, microprocessor, battery and data card and will be set to make intermittent recordings during those parts of the day when Cicadetta montana is most active. "Every five seconds, [the device] wakes up, listens, does some analysis on the sound and makes a decision, 'OK does that sound like it could be a cicada? ', and if it does it can then make a recording onto an SD card," explains Dr Rogers. The recordings won't be transmitted automatically this time, but rather collected from the SD cards every couple of months by a group of volunteers. Once the data is analysed more closely, the team hopes to identify recordings of calls that could only have come from the cicada. The idea is part of a new wave of audio-related citizen science wildlife projects. This summer, for example, the UK's Centre for Ecology and Hydrology launched its iRecord Grasshopper app, which helps users identify a variety of insects and upload recordings of their calls. The idea is to better inform scientists about the singing patterns and distribution of the creatures in the UK. There's also The Bat Detective, an initiative which asks internet users to listen to recordings and identify bat calls within them. Kate Jones, a biodiversity expert at University College London, is overseeing the scheme. She says recordings correctly labelled by human listeners will be used to develop algorithms which can then identify bats from audio files automatically - a bit like the cicada app. Around 50,000 classifications have been done by members of the public already. "We're getting people to listen to bat calls so they can tell us where they are," she says. "It trains [the computer] just like a voice recognition system." And Dr Zilli has also thought of another application for similar technology - detecting malaria-carrying mosquitos. He's now working on a system to analyse the sound of mosquito wing-beats. "If we can specifically identify those species that are vectors of human malaria then we can alert people and start collecting some data around the world on the presence of these mosquitos," he comments. Meanwhile, the hunt for the New Forest cicada continues. "It's an iconic insect," says Dr Brock as he explains that there would be huge interest from the scientific and conservation communities if it were ever found in Britain again. And Dr Zilli adds that thanks to the interest of citizen scientists, there are now thousands of people connected to the hunt who would feel a real sense of accomplishment if the search were ever successful. "Certainly for the person who finds it but also for all the other contributors around the forest, it would be an absolutely fantastic discovery," he comments. If the cicada is out there, this group of intrepid scientists and volunteers might just be about to find it.